of South Indian state of Karnataka renowned for its lush green hills, cardamom and coffee plantations, dazzling waterfalls and immaculate natural beauty. 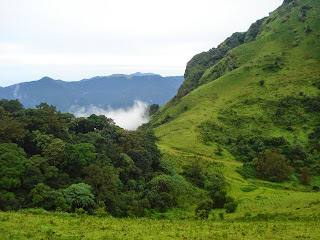 The places in and around Coorg offers excellent tourist spots along with number of adventurous activities like angling, trekking, mountain climbing and rafting which attracts tourists from across the globe. Omkareshwara Temple: Constructed by Lingarajendra II in 1820 in Mumammadan style of architecture with a fusion of Gothic and Islamic style, Omkareshwara temple is a Hindu temple devoted to Lord Shiva. According to the legend, the king put a Brahmin to death and that the spirit of the Brahmin that he killed sued to appear in his dreams, thus to appease the spirit of that Brahmin the temple was constructed. The temple is adorned with a dome in the center with four turrets at all the four corners, a pool in front of the temple with plenty of fresh water fishes, a Linga which is installed at the entrance door and windows which are intricately designed. Visitors can read the history of the temple in a copper plate fixed at the entrance. Madikeri Fort: Constructed in the 17th century by Mudduraja as a mud fort, the fort was later re-constructed by Tipu Sultan in granite. The fort is festooned with two fascinating mortar elephants at the entrance and vintage clock tower along with being a storehouse of the remnants of the British Era. The fort houses an Anglican church constructed in 1855 AD which has now been transformed into a museum, antique pieces of Coorg, temple and a prison. It is suggested to visit in the evenings to get a more captivating sight of this fort against the backdrop of the glittering burning sky. The land of brave people, the people of Coorg are known for their hospitability and great sense of humour. It is inhabited by the Kodavas and other people who follow Muslim, Christian, and especially Hindu religions. Madikeri Dasara, Kunde Habba (tribal festival) and Cauvery Sankramana are the major festivals celebrated by the residents of this region. The people stills follow some ancient and traditional customs in rituals and religious festivals. The cuisines are known to be the most delicious in all of South India owing to its typical preparation. Pork is served in many religious occasions. Sea foods are also preferred by most of the people. Some of the culinary delights of Coorg include Akki ooti, paputt and kadumbutt. Kannada and English are the main languages. Cardamom, Coffee, honey, orange and pepper are most flourishing and successful products of Coorg. Raja’s Seat: Formerly used by kings as a place to spend some serene and tranquil moments with their queens along with witnessing the astounding views of the surrounding environment, Raja’s Seat is one of the major attractions constructed by the kings of Kodagu. The toy train for kids is another added attraction of this place. Presently, this place has been changed into a public garden and has been adorned with vast species of flowers and a brick and mortar structure with four arches to make it even more beautiful and composed. While in Coorg, make sure to visit this place to relish some grandiose views of the sunset and also to rejuvenate you from the daily hustling and bustling of city life. Abbey Falls: Another attraction to venture is the scenic Abbey Falls where you can head out for a picnic or just for fun. The astounding view of the water plummeting from an elevation of 70 feet before merging down on the river is what attracts the visitor to this falls. Positioned at an expanse of about 7 km from the main town of Coorg, the journey to this private fall will feast your eyes and soul with integrated cardamom and coffee plantations, picturesque views which is sure to satiate your hunger of staying close to nature. Furthermore, the roaring sound of the cascading water which is bordered by emerald surrounding and scenic landscape will provide you a lovely and memorable time. Rafting in the thrilling and exciting waters of the Dubare River (about 37 km from Madikeri) and rock climbing and trekking in Kakkabe (about 18 km from Madikeri) are the other activities that tourists can enjoy while in Coorg. Visitors can also wash elephants and watch them indulging in various activities in their native habitat in the Dubare Elephant Camp positioned on the bank of the Dubare River. Make sure to carry a camera to capture some of the striking sights of nature while on these spots.